Here we present some machines for alien simulations. They were constructed by hand and exhibit certain interesting features. Some of them can be used for further studies of evolutionary processes. The examples can all be found in the repository and are included in the installer. If you would like to provide own examples here please contact me. This machine can handle self-replicator by self-inspection and a simple foraging strategy. It consumes nutrients (other nearby structures) to obtain additional energy. As long as it has enough energy it produces an other machine which is a copy of itself. This is achieved by an interplay of a constructor which obtains its data from a structure scanner. 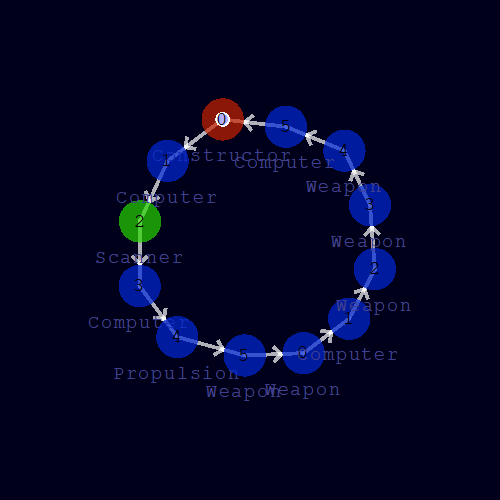 Initial composition of the replicator. The scanner is the green cell and the constructor the red cell. This snapshot was taken during a division. A new machine is built which will be copy of its original. After several divisions one finds many functioning and also damaged copies of the original one provided that enough nutrients are available. These replicators can also consume each others. That is one main reason for the damage to some of them. The spiral builder machine builds curved structures of growing circles until it reaches a critical energy level. All the energy for the building process is stored in the token. It does not consume energy from other structures. At the beginning the machine consists of five cells: one constructor cell (red) and four cells for calculation of position and distance of the offspring. A first circle is built after several time steps. The radius of the structure is growing. After many further time steps a spiral structure with slightly irregular shape can be observed. The irregularity results from the discrete computations which are not synchronous with the building processes. The heuristics for the radius computation could be improved. 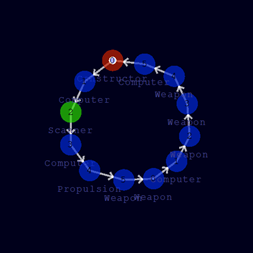 The random builder machine builds curved structures of circles with pseudo-randomly varying radius until it reaches a critical energy level. Beside that its behavior is similar to that of the spiral builder. The construction is the same as for the spiral builder. The only difference is the programming of the building process which is not visualized. ...and results in curved irregular structures.